Brilliant medical student Michael (Oscar Isaac) meets beautiful dance instructor Ana (Charlotte Le Bon) in late 1914. Their shared Armenian heritage sparks an attraction that explodes into a romantic rivalry between Michael and Ana's boyfriend (Christian Bale), an American photojournalist who's dedicated to exposing the truth. As the Ottoman Empire crumbles into war-torn chaos, their conflicting passions must be deferred as they join forces to get themselves and their people to safety. The 'The Promise' competition has now closed. Winners will be announced shortly. Competition opens at 5pm AEST on Sunday 24th September 2017 and closes at 11:59pm AEDT on Sunday 1st October 2017. Five winners will be chosen at random on Monday 2nd October 2017. To successfully win, entrants must fulfil the above entry conditions before the time the competition closes. Current members/followers are eligible to enter the competition. Only one entry per person. Only one winner per household. To be a valid winner, the entrant must not have won a prize from SWITCH within the last 28 days. 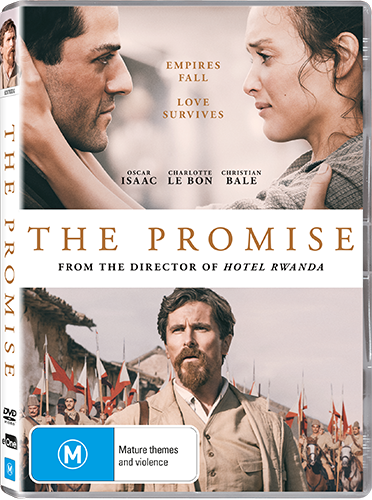 Each winner will receive one DVD copy of 'The Promise'. By entering, you agree to receive occasional emails from SWITCH in the future. If you decide to unsubscribe from these updates, any further entries will not be applicable. Only Australian residents are eligible to enter. 'The Promise' is available on Digital and DVD on Wednesday the 27th September 2017 from eOne.